Left to right: Mimori "Mimorin" Suzuko (Takenouchi Sora), Enoki Junya (Takaishi Takeru), and Ikeda Junya (Kido Jo). November 20th, 2015. 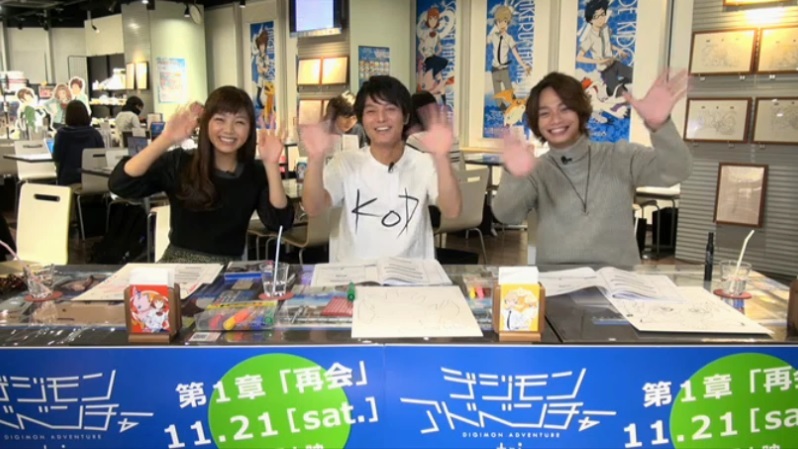 As a prelude to the Japanese premier of Digimon Adventure tri., Bandai & Toei organized a special livestream hosted by the voices of three of the movie's principle characters, Mimori Suzuko, Enoki Junya, and Ikeda Junya. (Jokingly introduced as "double Junya.") 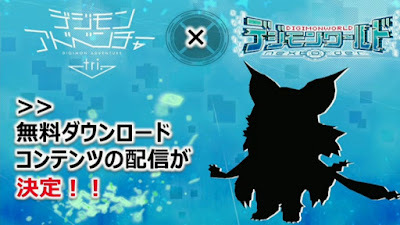 The broadcast, which clocked at about an hour and a half, featured its hosts showing off a number of new products created for tri., announcing new information on Digimon, and participating in activities together. Fans were receptive to the stream, breaking into memetic cries of "JOOOOOOOOO" at any mention of Kido Jo, flooding the screen with his name. A recording of the stream can be viewed below. 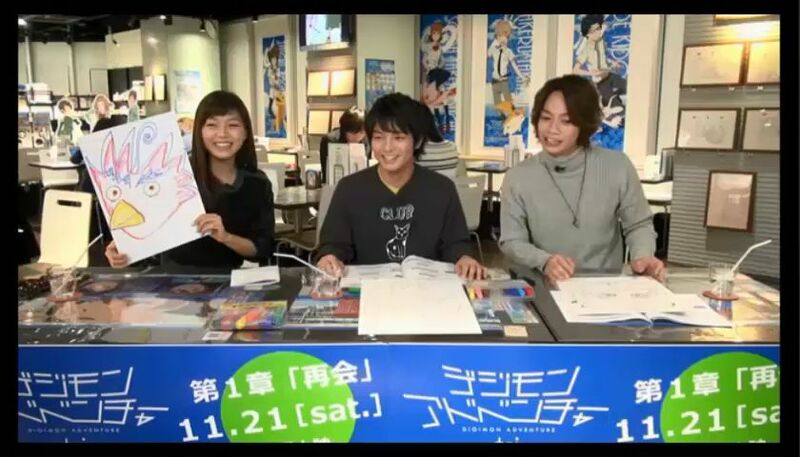 The broadcast opened with a survey of the viewers asking how they planned on seeing Digimon Adventure tri. 49.2% of respondents said they would see it at a theater, 13.2% said they would see it through iTunes or PlayStation Video services, 16.2% said they would see it on Blu-ray or DVD, 10.6% said they would see it in a theater and then buy the packaged version, and 10.6% were undecided in where they would see tri. 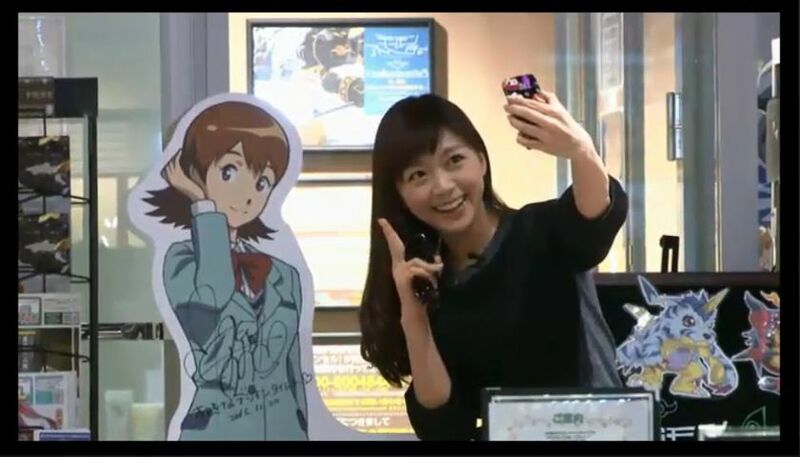 Mimori Suzuko was as enthusiastic as ever, caught taking selfies of herself with her character's stand, and beginning her tri. 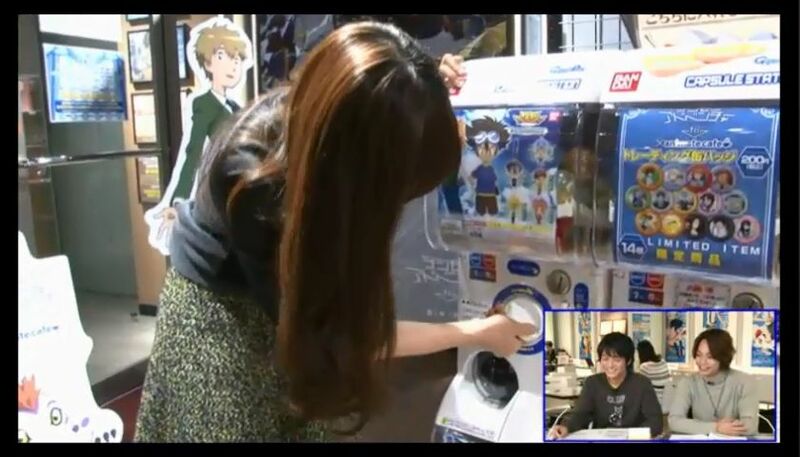 gashapon collection on camera with a test run of the newly-released machines--which initially seemed to eat her money, until she realized it was a 300 yen machine and not a 100 yen one. "Who will it be? Who will it be? Who will be born? Ah, Yamato is born." Mimori also showed off backstage notebook with well-wishes from several Digimon staff, including Yoshida Hitomi (current voice of Tachikawa Mimi), and Tamura Mutsumi (Izumi Koushirou). "Wait, this isn't a spoon, this is chocolate!" 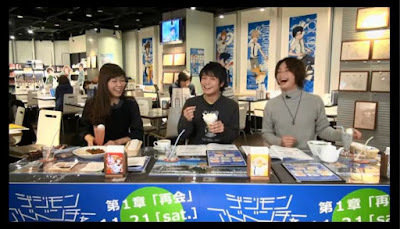 The three of them were served each of their characters' corresponding dishes from the currently-running Digimon Adventure tri. Animate Café; Mimori was served a Magical Fire drink with Sora's "Love-filled Tomato Stew," Enoki was served an Air Shot drink with Takeru's "Angel Parfait," and Ikeda was served a Marching Fishes with Jo's "Praying to Pass! Exam Chazuke." Enoki initially mistook the white chocolate wings in the parfait for a spoon, prompting admonishing cries of "Takeru!" 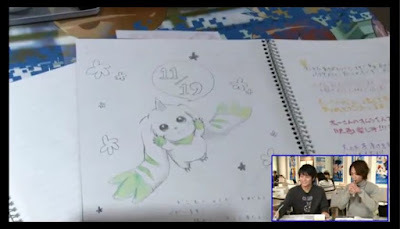 A group speed drawing session with the seiyuu drawing their characters' Digimon partners quickly went awry when it became apparent that both Mimori and Enoki's skills were lacking; Ikeda accused Mimori of drawing Big Bird instead of Piyomon. 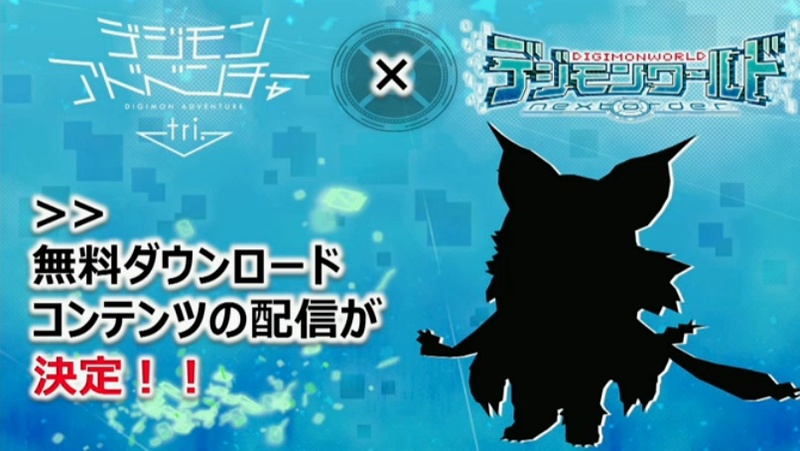 The TGS trailer for Digimon World -next 0rder- was also reviewed during the broadcast, after which a special announcement was made that tamers will be able to get a special Adventure tri. related download in the future, downloading the movie-original Maicoomon into their games. The first twelve minutes of Reunion were then shown to promote the film, and as the broadcast drew to a close the tone became somewhat more somber. Mimori implored fans to see the film, stating that she had the feeling something amazing had begun. 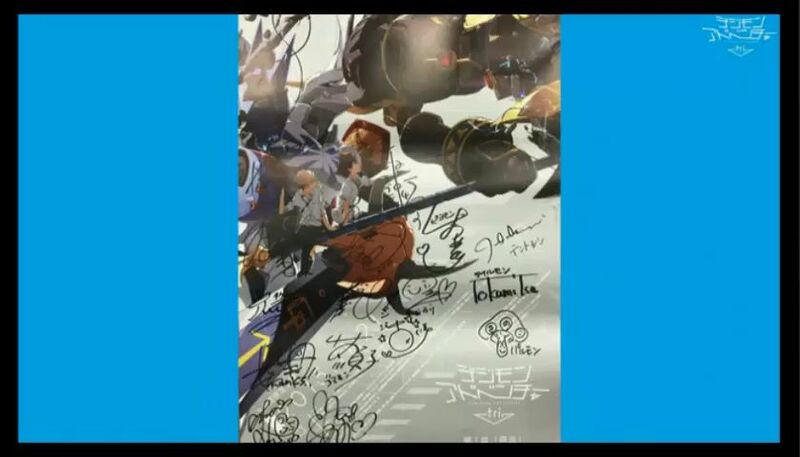 Enoki closed it out with a view of the film's poster, autographed by a combination of the original and new voice cast for the chosen children. The special livestream drew over 50,000 simultaneous viewers at its peak and just under 80,000 comments, posted live through NicoNico Douga's unique inter-video comment system. Afterward a staggering 88.3% of viewers rated the stream as "Very good" in NND's standard post-stream poll, 8.4% "A little good," 31.8% "Ordinary," 0.4% "Not very good," and 1.1% "Not good." The majority of livestreams never break 80% for "Very good" ratings. A subsequent poll rating Wada Kouji's newest recording of Butter-fly, shown after the stream, was ranked 94.2% "Very good," 3.7% "A little good," 0.9% "Ordinary," 0.3% "Not very good," and 0.9% "Not good." The Butter-fly recording is not included in the video for copyright purposes. The ORIGINAL cast?! Even if their voices have changed, it's amazing that they're still willing to get involved in Tri. 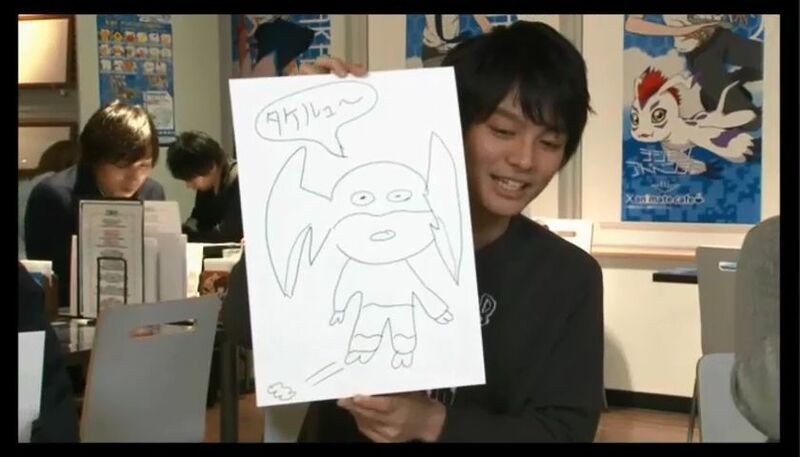 The Original Name of Digimon was "Otokotchi"